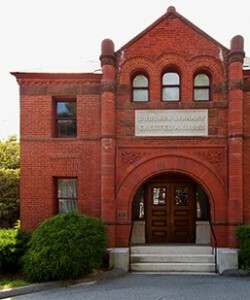 The Goodnow Library opened its doors on April 4, 1863 as the second free public library in Massachusetts. The library was a gift to the town of Sudbury by Sudbury Native John Goodnow. Mr. Goodnow bequeathed $20,000 to the town for “purchasing and keeping in order a Public Library for the benefit of the inhabitants of [Sudbury].” He also gave three acres of land, and $2,500 to erect the building. With 2,300 volumes in circulation, 31,000 square feet of space and one librarian (Samuel Puffer), the new library welcomed people of all ages, offering resources that went well beyond books. The library was also a space to socialize just as it is today. The library began as an octagonal building with windows on all sides and a cupola on top. Additions were added in 1885, 1894, 1971 and finally the largest in 1999. Throughout all the library’s changes, the original 19th-century building remains. It has been carefully restored to resemble the 1863 structure, and is listed on the National Register of Historic Places. Today – as it was 150 years ago – Goodnow is a central destination for learning, pursuing interests, and meeting friends and neighbors. People come to see one another just as much as to learn from a program or enjoy a book. While true to its founding mission, Goodnow is always evolving, according to the library’s director, Esme Green. Referencing Shiyali Ramamrita Ranganathan, the father of library science, she compares the library to a living organism, which is always evolving. “Libraries are never static – they never have been and never will be – and Goodnow is no exception. We’re always collecting new materials and bringing in new people. And we’re evolving even faster than in the past because of rapidly changing technology. We’re embracing these advances and growing with the times to keep our constituents both informed and engaged. For the past three years, the library has been doubling its budget for e-books, adding thousands of titles to its free and ever-growing collection of more than 300,000 circulating items. As for the future of the library, Esmé Green predicts that while the space may be used differently, it still will be a big part of peoples’ lives. Goodnow received 9th highest ranking among more than 100 libraries serving a similar population throughout the Commonwealth by the MA Board of Library Commissioners.